For bread croutons, drizzle olive oil over bread slices and rub with minced garlic. On a cast iron griddle or outdoor grill, grill bread slices over medium heat for about 3-5 minutes, until crisp and toasted. (Alternatively, you can place them on a baking sheet and broil for about 2-3 minutes per side in the oven.) Cool completely. Cut into 3/4-inch cubes. 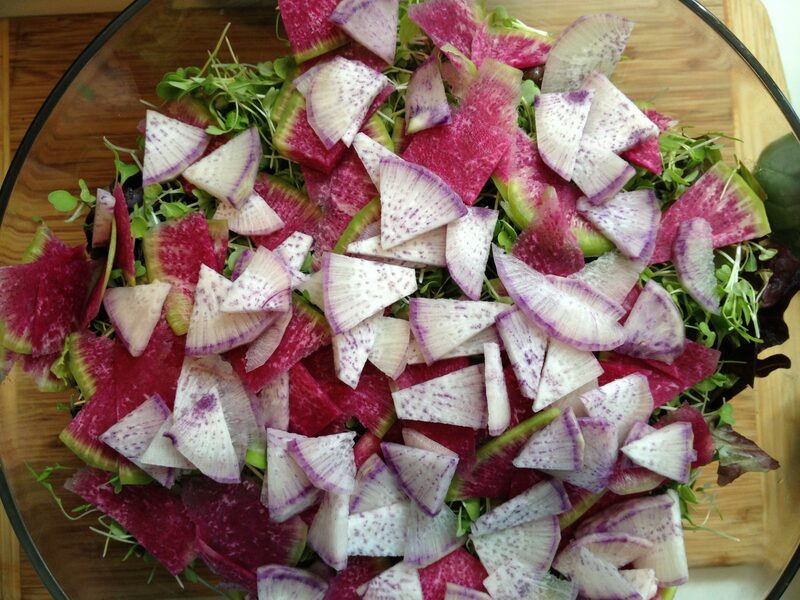 Toss bread cubes in a large bowl with greens, radishes, onions, olives, and cheese. For vinaigrette, whisk lemon juice, mustard and capers together in a small bowl. While whisking constantly, pour in olive oil. Add salt and pepper, to taste, and whisk again. Pour some of the dressing over the salad and serve the remainder at the table. Enjoy!